Anyone who is healing from infant or child loss knows there is a great divide you approach.At some point you find yourself having lived more days without them than you were blessed to count with them. And it is a place marked by time and pain. It settles in your soul with a fog of desperation. Half of you is certain that this cannot be. The other half is devastated to know that it indeed just is. God is very kind. Especially kind to me. So He did something very kind to mark his love for me as I marked the 41st day AE. . . After Ellis. He accepted me back into agreement with Him. He didn’t hold a grudge or rub it in. He just held my heart and rubbed my swollen eyes and heavy heart with His grace. This was the posture of my heart when I reached that great divide that death makes of those lives left behind. There were 41 days of Ellis Grace. And now, 41 days have passed since her glorious radiance faded from this earth and appeared in a place called Heaven. . . Her number is 41 and that is no accident. 41 is a good number. I said that many times before I believed it to be true. Because sometimes that’s what obedience is. It’s going through the motions until your heart decides to come along too. . .
41 is a good number. It is the number by which God chooses to deliver His promises and declare His victories. The Israelites wandered in the wilderness for 40 years but were delivered to the Promised Land on year 41. It rained for 40 days and 40 nights but dry ground was found on Day 41. And my sweet Lord Jesus fasted in the desert for 40 days and suffered intense temptation from Satan. He was victorious on Day 41. And now I too have been lost and weakened and tempted for 40 days. Tempted to remain bitter, arrogant, and confused by my circumstances – – by the depth of pain in my heart. Tempted to value the feeling of being “right” over actually being right with God. 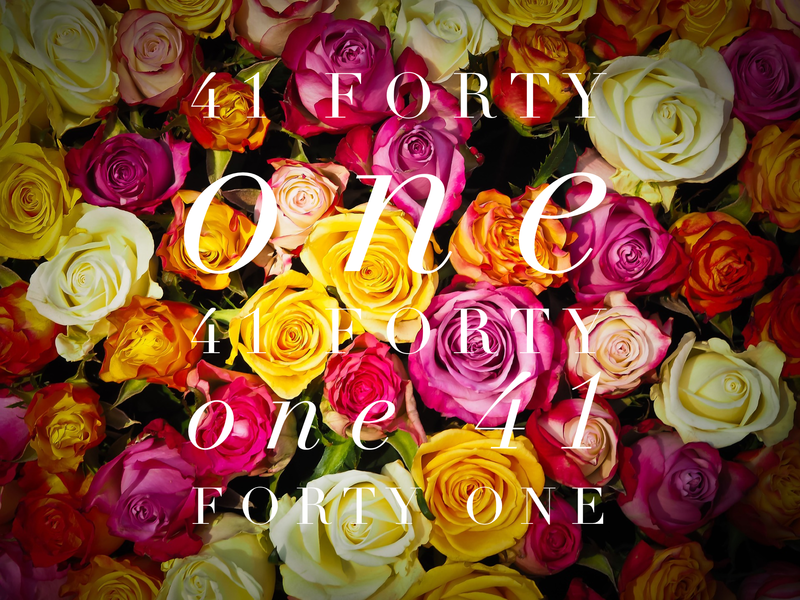 Forty one is the number for promises fulfilled, victories declared, and Gods people delivered. I shouldn’t be surprised that I too have been delivered into reconciliation with God on this- – the 41st day. But to be completely honest, His miracles and His mercies and His incredible kindness still surprise me. . . I used to say 41 is a good number, but I didn’t believe it. And now I can say wholeheartedly that 41 is not just a good number. It is the best number. The path to reconciliation was paved with truth and obedience. . . Two things that always lead directly to the heart of God. Praise God for his goodness! That’s such a wonderful gift. The significance of the number 41 -what an awesome realization. I know u don’t want praise but I’m amazed by you and your God. What was the best part of Saturday? Looked like fun on FB! The best part of Saturday was dancing without breaking down emotionally and the Rev Well workout session. It was amazing! So good!